Buckeye Game Fest 2019 will be held September 5-8, 2019. The War Room at Buckeye Game Fest will be held September 2-8, 2019. Located at the Hyatt Regency at 350 North High Street connected to the Convention Center in downtown Columbus. Buckeye Game Fest is central Ohio’s premiere board gaming convention. Best know for our open board gaming space, and featuring the Columbus Area Boardgaming Society‘s extensive game library, this convention has been a local favorite for over two decades. Check out a game you’ve been dying to play or bring your own. Our main gaming hall doors and tables stay open the whole convention. 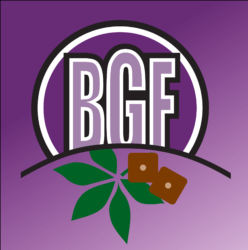 Thursday September 5th: 9 a.m. – 12 a.m.
Friday September 6th: 9 a.m. – 12 a.m.
Saturday September 7th: 9 a.m. – 12 a.m.
Sunday September 8th: 9 a.m. – 3 p.m.
*Must have BGF 2019 badge & valid government issued ID to check out a game. Hosts over 100 events, including: Artemis ship bridge simulator, Elder Entertainment role-playing events, brand new play tests, and more! Annual consignment store : You can sell and purchase games. Annual Raffle: Chane to win great prizes like badges to Origins Game Fair, Weekend stay at Ravenwood, games and more. 50% of the proceeds will be donated to The Extra Life Campaign. Want to receive our news letter? E-mail: kristing@buckeyegamefestivals.com to be added to our distribution listing.